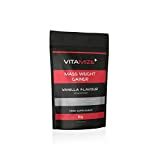 Extreme Mass Gainer from Vitamize has been formulated with the knowledge that in order for the body to increase in serious mass it requires a regular stream of quality calories. Unlike some other “mass gainer” products on the market, this is a genuine energy-rich and “high cal” weight gaining agent. In addition to five types of protein, an array of complex carbs this product also contains beneficial fast burning MCT oils. MCT oils are used in this product and are highly beneficial due to their ability to provide more energy per gram than the simple presence of carbs and proteins. These agents are rich in the “good” saturated fats and not the fatty acids that have been associated with heart problems. This product boasts a high quality and quantity amino acid roster crucial for muscle growth. The amino acid profile assists in nitrogen balancing which is hugely important for quality muscle growth. The additional presence of glucose and rice starch (non-allergic form) are smartly coupled in this product to provide the required energy needed for metabolic activity. Whether it’s competitive bodybuilders, Olympic sprinters, triathletes, strongman competitors, professional fighters or extreme sports daredevils the fact remains that some of the elite of the elite in human performance are utilising Vitamize’s expertise.